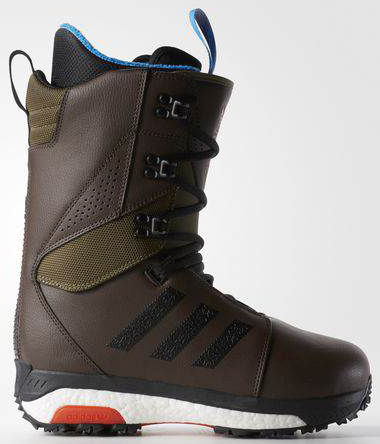 The Adidas Tactical ADV snowboard boot that we instantly fell in love with. The major stand out is the next level shock absorption and although the fully articulating cuff is very well liked. This boot is not without faults but it is what most of us wear at The Good Ride and it works with a wide variety of boards and bindings. If you are all about long-term reliability, a reduced footprint, shock absorption and if the tounges downward pressure doesn’t bother you the Adidas Tactical ADV is a great call. 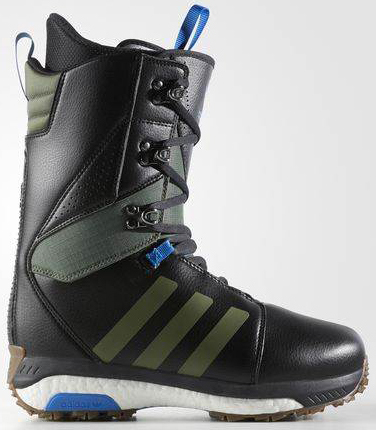 We suggest going 1/2 size down from your normal foot size because the 2018-2019 Adidas Tactical ADV runs 1/2 size big. For example, I’m a size 9 but wear an 8.5. There were also no changes from the 2019 Adidas Tactical ADV compared to the 2018 model. Fit: The fit is just like a Burton that’s on the wider side of regular in the toe box so there is room to use the toes. The size 2017 size 9 felt about a 1/4 size large and with the change to the liner, the 2018-2019 Adidas Tactical ADV feels like it’s up to a 1/2 size large so that’s why the 8.5 fits so well now. It actually fits better than the 2017 Size 9. Flex: It’s pretty medium stiff and seems like it will stay that way for a good while. Comfort: I had some issues with the 2017 model in size 9 but none with the 2018 size 8.5. I haven’t felt that instant comfort in a long time and it’s not easy to do. So if you can go with the 2018-2019 Adidas Tactical ADV because the fit is so much better. The 2017 model is not 100% love at first try but it’s probably more around 80% love. There is a little mellow pressure on the roof of my foot just below the ankle which is I thought might be a big issue but instead, it faded throughout the day as I rode it the boot conformed much better to my feet. Now it’s a very comfortable boot to ride and my only suggestion is to take it slowly on breaking it in as I described above in the video. Heel Hold: Very good heel hold and I don’t feel the heel lifting at all. I have slightly thicker ankle joints so I don’t often have heel lift but this felt pretty good. I would like to see an option on the inside of the shell or outside of the liner with Velcro for J-Bars but many will stick to the liner material so it’s not a super big deal. Adjustability: Traditional Lace Boots still have an advantage over all other lacing types except hybrid setups that have something extra along with traditional lace. It takes more work but if you can tie a mountaineers knot you can really dial out your boots to fit your foot better than any other lacing system. Flex Retention: This is the best in the Adidas line when it comes to flex retention mainly because of the fully articulating cuff and the sturdier material on the outside. The liner isn’t anything to write home about and it would be nice to see some reinforcement in the areas with the most flex but still, overall it’s on the higher end of the flex retention spectrum. This is a great choice for the 100 day a year rider. Turn Initiation/Response: The tactical is pretty responsive if it’s tightened up but a nice smooth medium response if the upper rungs are left a little loose. That’s one of the reasons I love the versatility of traditional lace boots with an articulating cuff. Traction: There are soft rubber spikes places throughout the boot so it will hold well in almost any kind of snow. Shock Absorption: This shock absorption is really next level and I can’t say that I’ve experienced anything like it. It’s not just cushy but really springy too so it doesn’t really feel like you are loosing response. Footprint: Very reduced just like the rest of the line and it’s at the top of the industry. It’s the kind of boot that can really help reduce toe drag. This is a comparison between size 9 boots. As the sizes get larger we have noticed less of a difference when it comes to footprint size but Adidas is still a little bit smaller. You can also see like it seems Adidas will be less likely to have heel or toe drag by the way the sole tapers up in the heel and toe. Here is a pic of the 2017 boot which is almost the same as the 2018. The only thing is an 8.5 seems more the equivalent to the 9 Burton so it’s a little smaller. On & Off Ease: Traditional Lace isn’t that bad and it’s much easier than people think. Yes it’s slower than Speed Lace or BOA but not by much. It’s almost as fast as BOA if you are one of those people who are constantly micro adjusting because when a BOA is undone it opens up pretty quick. Just to let you know in the vids this was a size 9 boot reviewed last spring and after trying an 8.5 I realized that all the little problems I’m talking about in the video aren’t there with the size 8.5 production model and the fit/comfort was much better. We try to get as many images of the Adidas Tactical ADV, but forgive us if they're not all there. Reminds me of the original Burton Ruler back in the day with more boost and cush. After heat molding have a very good fit. Love the feel. If they retain their flex for 2 seasons that would be great. Really wanted to like these but less than ten days into the season, the lower part of the boot shell deformed/collapsed and the dreaded top of foot pain ensued. It's a genuine issue that can ruin your day and make the boots unusable. On the upside, the Boost shock absorption is next level. I came from Nike Lunarendors and found the Adidas a way better fit, much lighter, with a shorter footprint. But the Lunarendors lasted three seasons and still hold up. Really like the liner, sole, appearance—everything. Would be a perfect boot if the shell were up to par. Owned the 2017 and 2018 models. My experience was very similar to the team at TGR. 2017s took about one day to break in, the 2018s took only a few runs. I’ve got fussy feet and find traditional laces the best solution for getting a comfortable fit. These are the most responsive traditional lace boots I’ve found and I use them for all my riding. Regarding the many comments about sizing for these, I take 11 in Burtons, 10.5 in Vans and 10.5 in K2s. The Adidas 10 fits me perfectly. I scoured the net for boots prior to a trip out west. Found these, knew there was a potential for top pressure, and bought them anyways because of the traditional lacing. There was no top pressure and I absolutely loved them. I purchased a half size smaller as recommended and they fit like a glove. For me, they were exactly what I was expecting by reading this review. Many thanks. Ive owned these boots for one season and was really hoping that they would fix them self, but after 30+ days of riding and even heat molding them. I still get top foot pain on my front foot. I tried everything from loosing the top or bottom of the boot or a combo of the two but the pain still would not go away. Please stay away from these boots and just go with a pair of burtons if you want foot shrinkage technology. I love these boots, super comfortable. I was a little nervous as I have heard some reviews of pressure points at the top of the foot and heel of the ankle. I have flat/low arch and wide feet so these boots works perfectly for me. I had the Ride Trident and there was no shock absorptions whatsoever. I also struggled with jumps as my ankle had no flex and it felt retrained. (It is is a free ride boot so it is to expected). The Adidas tactical is the complete opposite. 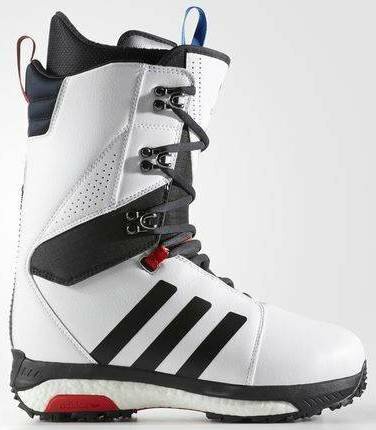 They are awesome and I hope Adidas keeps making these boots. If they don't I plan on buying a bunch in bulk to last me a while. Highly recommended! These boots are extremely comfortable in my opinion. The Boost knocks down vibration and the laces offer great adjustability. I also tried on the Acerra thinking I might prefer the added response, but felt the foam to be too rigid and not as comfortable as the Tactical ADV's. Huge thanks to James and TGR on this recommendation! Great soles, decent liner. Tongue too stiff. This is to compensate for articulated cuff and medium flex shell. For riders with higher instep the tongue pressure on the top of your foot, especially on a toe turn becomes unbearable. Can’t use them. Last year’s boot didn’t have this problem. I purchased this boot mainly because of this review. 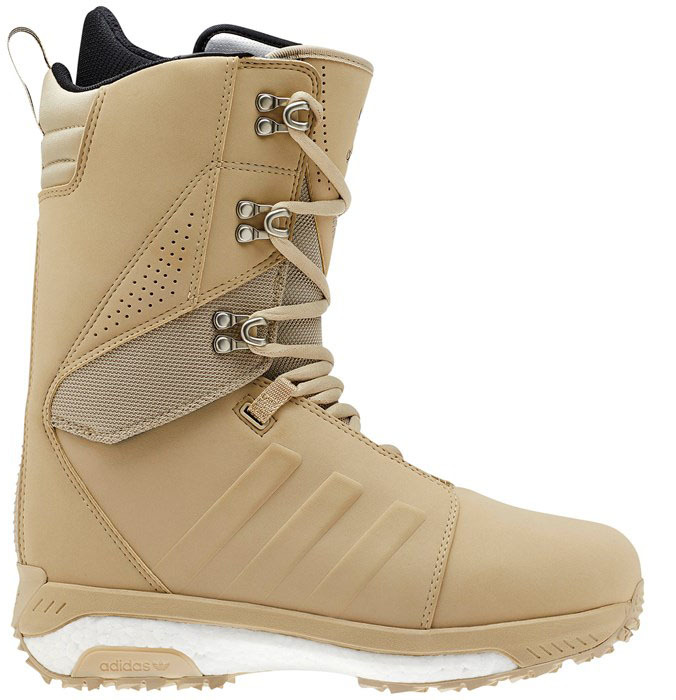 As I mentioned in my review of the Burton Imperial I needed a new boot with a low profile, so the Tactical seemed like a good fit and i ordered it, since i couldnt find it in any shop nearby. The first Impression was, let\'s say different to what i was used to in Burton Boots. The liner felt quite hard and also thight around the ankle. So after the first few minutes i was already thinking about sending them back but i decided to put them on for a good hour around the house and they got more and more confortable. When i switched back to my (also new, they just have 2 days on them) Imperial the difference was quite shocking. I felt almost no foot support with the Burton the adidas liner uses a somewhat harder material, which at first seems more uncofortable than the very thick and plush Burton liner but i hugs your feet so well and you feel very supported so in the burtons now i just feel \"lost\" althought length-wise i definately need a 11 in the Burtons. In the 10.5 Tactical i have even more room length-and-with-wise than in the burtons! Also the quality-difference is really shocking the Burtons feel really cheap compared to the adidas and less supportive, the Burtons feel like all the response comes just out of the tongue whereas the adidas is a all around sturdy snug fit whitch gives you the response. I also noticed the inward-lean of the burtons alot and would like to see that on the adidas too. I noticed the Burtons are also quite a bit lighter, almost 200g which is alot, that\'s mainly because of the better materials used and the oh-so-great sole of the adidas, soooo cushy and confortable. 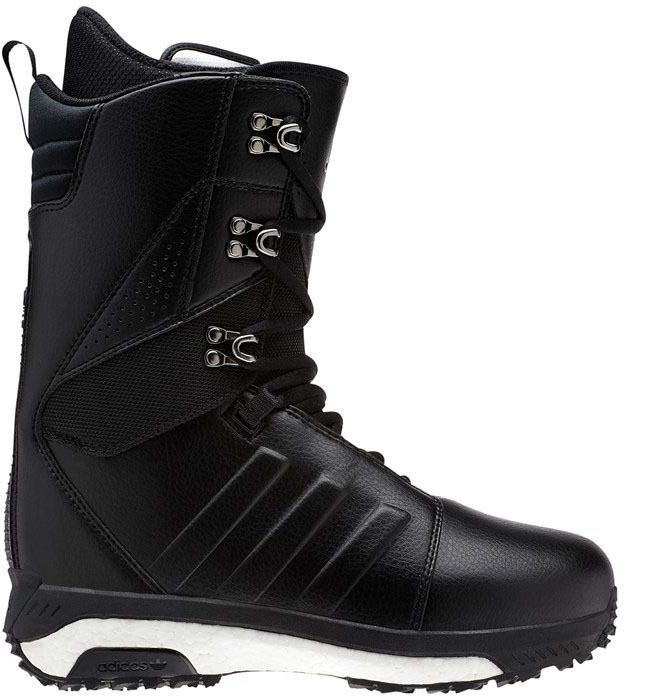 But the tongue-construction is a big plus for the burton and pretty much my only but big issue with the adidas. After wearing them for about 2 hours in the house the adidas already conformed a bit to my feet and were really comfy now with one exception, on one foot i got a pressure point on my inner ankle/instep where the liner tongue and outershell of the liner overlaps but this wouldnt be a big issue because i could just cut the tongue if the liner out a bit so it doesnt overlap anymore if it wouldn\'t have faded over the first few days. And the absolute biggest plus for me: This boot is f****** tiny! 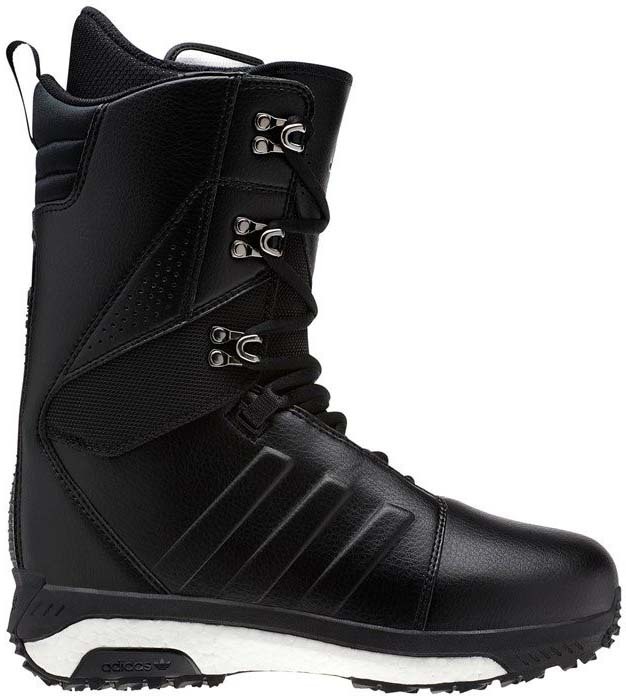 Its not even a fair comparison to my Burton 11\'s, which fit the same on the inside, length-wise. Its at least a full size shorter and alot less bulky it fits my Burton M bindings perfectly i even have space left. So if you have bigger feet definately have a look at this boot if it fits you this could be a game-changer. I\'d say with this boot you can ride a regular width board up to a size 11 with no problems unless you are into super-agressive carving. So after wearing the boots in the house for about 2 hours and flex them quite alot, the first impression was very positive. But after reading so many reviews, which state, that there is pressure on the top of the foot when leaning into a toeside turn i wanted to test it as much as i can, so i got my board out and strapped in on my carpet. I really wanted to keep this boot just because of the tiny footprint and great sole but im just not willing to risk it for 350 bucks so sadly i will have to return it. Maybe there are just some faulty ones out there? Also i have to disagree with james on the fit, it fits quite different than my burtons, its really slim around the ankle but with enough room in the toebox, the burtons have way more room in the ankle/instep section thats why the adidas fit me so well i have a thinner ankle and the adidas hugs it so good i get no heel-lift in these whereas in the burton i always got alot of heel-lift. So to summarize i will send it back but i think its a great boot if only they fix the middle part of so it doesnt collapse under the ankle-strap, maybe a stiffer tounge would fix this...? Also i would like to see them making a liner which like burtons doesnt overlap in the instep, section. So could be a great boot and i still recommeand to try it out, maybe you dont get this issue, maybe it even wouldn\'t be that big of a deal on the mountain but i dont have the guts to risk it since it would be very hard to sell it again once used. And i also dont see this issue get better with the boot breaking in i bet this would only get worse as the boot gets softer. So yeah just make sure it\'s not an issue for you before you buy it. I will definately have a look at this boot again next year to see if they fixed this issue because it would be a great boot otherwise. I live on this website for reviews and have scored many great products based on the goodride tests. I hate these boots. Previously I had Salomon F4.0 and they discontinued them so I needed a new boot. These were rated as high as F4.0 but can’t hold a candle to them. They give such bad top pressure on my foot and the boot themselves are creasing so bad that the black stripes are even peeling off. I’ve only used them ten times this season but they are getting worse as the break in.